A t the conclusion of every concert, be it a summertime serenade in the sun or a winter holiday concert full of Christmas cheer, the Band autographs the concert and seals its performance with a spirited rendition of the “Repasz Band March.” This popular signature march has been a part of the Band’s life since its original band edition was copyrighted in 1901 by Charles C. Sweeley and Harry J. Lincoln, a composer known for his many marches. 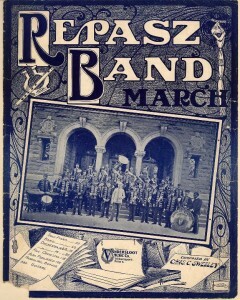 The cover of the 1901 piano copy of the march pictures a smartly uniformed, forty-member band with a cornet-playing bandmaster (possibly W. Herdic Wood, the conductor from 1902 to 1910).”4 The Repasz Band has gratefully received and performed this product of local creativity and talent as a testimony to the Band’s abiding connection to the historical Williamsport community. Recent documentation discovered by John Hunsinger in his research, including a sworn affidavit and copyright application, indicates more strongly that Lincoln may have actually been the composer. Even though the Repasz Band plays from an edition listing Harry J. Lincoln as composer (arr. Paul Yoder), concert programs and announcements list both Sweeley and Lincoln, acknowledging the unresolved question of the actual composer, and crediting both gentlemen. 4 Norman E. Smith, March Music Notes, Lake Charles, LA: Program Note Press, 1986, pp. 402-403.